We work in close collaboration with many highly regarded architects and our aim is to build to the highest possible quality for a competitive price. We are happy to work under architect instruction or direct with the client. We can offer a total project management service if required we will keep you informed of progress and work with you to ensure that everything is built exactly to your requirements. Our aim is to provide a friendly but professional service as close liaison is essential to ensure that the finished build is as you originally imagined, which have been completed on schedule, on budget and to our your satisfaction. On all projects we build good relationships so it is usually possible to arrange a site visit so that you can see real examples of our work. We specialise in high quality individually designed new houses and refurbishments. We work in close liaison with the architect or the home owner to ensure that work is of the highest standard and meets all your expectations. We are happy to quote and provide all the building work necessary to take your project from plan stage through to completed home. We also offer the additional service of total project management within the quoted price. The standard of work we provide is excellent and we take great pride in our completed buildings and builds. We always work closely with building control and ensure that we are up to date with all the latest requirements and can help you create a low energy, sustainable home. New Builds/Refurbishments / Extensions/ Attic Conversions. 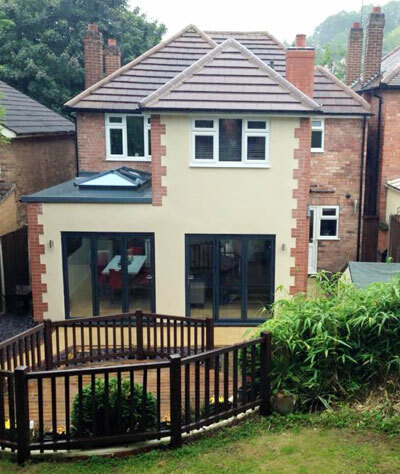 Our Projects page includes new build and house extension for examples. Extensions present a slightly different challenge as client relations can be especially important when you are living on a building site. We ensure our work is carried out with the minimum disruption and pride ourselves on ensuring that a friendly relationship continues throughout the project.